A circular walk from Settle in the Yorkshire Dales. From Settle the walk follows the Malham path over to Attermire Scar. From there it heads around past Victoria cave and on to Victoria cave, before returning through fields back to Settle. Parking: Car park in Settle off B4680 next to a garage and near the two churches (grid reference SD 819 638). Turn right out of the car park and walk along the road away from the railway viaduct. Turn left into the market square opposite the Royal Oak Hotel and go up Constitutional Hill, the road going up the left-hand side of the market place. The signpost for Constitution Hill does not appear for a further fifty yards, just after some black railings. Continue on up the hill for a further fifty yards and follow the road around to the left following the sign for Bowscales Yard at the T-junction. Just past this sign, there is again another sign for Constitution Hill on the side of a house. About fifty yards past this house, where the road flattens, turn up the rough walled track off to the right of the road by a telegraph pole. The track climbs uphill, and very quickly affords good views back down to the market town of Settle and Giggleswick. The lane begins to flatten and a gate is passed through on the lane by a ruined farmhouse. From here the lane is only walled on the left-hand side. About fifty yards ahead there is a signpost for "Malham 5 miles". Turn right at this signpost and head steeply uphill on the left-hand side of the wall. The views back down to Settle improve as more height is gained. Walk up this grassy hill for about four hundred yards, then bear diagonally left, whilst still climbing, to head over about fifty yards to a well defined wide grassy path alongside a wall. 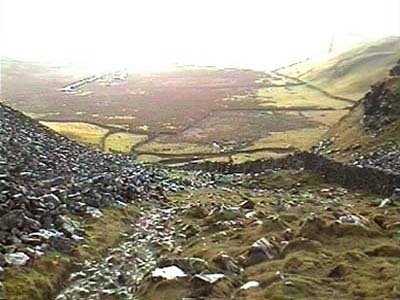 This path is then followed alongside the wall, which is at the bottom of the crags to the left. Follow the path towards a small gate in the wall that crosses the path. Go through a small gap in this wall just to the left of the gate and continue ahead. Forty yards past this gate the path forks. Take the left-hand fork keeping near to the wall. Continue ahead through the gap in the next wall that crosses the path. Warrendale Knotts can now be seen up to the left of the path. A further fifty yards on, the path again splits, with a minor path going steeply up the side of the wall, and the more major path going around the front of the crags. Take the right-hand path around the front of the crags, then continue ahead on the wide grass path heading down to the junction of two walls at the corner of the fields. Go through the gap at the corner of these two walls, and continue ahead following the sign "Public footpath, please do not climb on walls" and start to descend down the side of the wall. Attermire Scar is now clearly visible over to the left, with Malham Moor straight ahead. Go down the hill and over a stile on the wall. Continue straight ahead and go through a gap in the wall a couple of hundred yards ahead. On passing through the gap, turn left and head uphill in front of Attermire Scar. The path follows the right-hand side of the wall and climbs uphill. About thirty yards past a stile on the wall on the left, the path starts to meander away from the wall, keeping closer to the rocks at the bottom of the scar. Shortly after the path splits, it flattens and now can be seen for a long way ahead. Continue onwards on this grassy path passing Brent Scar on the right-hand side. The path heads for the wall ahead and skirts around the right-hand side of it then passes through a gate. Immediately through this gate there is a sign stating that "You are most strongly warned not to go into Victoria Cave as there have been serious rock falls near the entrance. The authorities take no responsibility for any injury or damage". Up to the right a narrow cave entrance can be seen, and a further one hundred yards on, a path can be seen heading up to Victoria Cave. A short detour can be made up to the cave, but as the sign said, do not go near the entrance. In front of the cave there is a board showing how Victoria Cave was formed. Return down to the path below and continue straight ahead alongside the wall. Go through a stile in the wall and drop down fifteen yards further on to a farm track. The route home goes through the metal gate immediately on the left, but a small detour of about two hundred yards can be made by turning right up the farm track and walking up to Jubilee Cave which lies just to the right of the track. Return back down and pass through the metal gate following the farm track downhill for three-quarters of a mile until it passes over a cattle grid by a gate and comes out on the road. From the cattle grid there is an excellent view across to Stainforth Scar and Stainforth down below it. About fifty yards past the cattle grid, where the track meets the road, there is a footpath off to the left signed "BW Settle 1¼ mile". Go through the wooden gate following this sign and continue straight ahead on the footpath which heads to the right-hand side of the wall. As the path bends around the trees to the left, Giggleswick Scar can be seen ahead. After a couple of hundred yards, the footpath leaves the first set of trees and heads about seventy-five yards in the same direction straight across a field heading for the junction of two walls. Go through a small wooden gate at the junction of these walls and continue ahead on a well marked path. Go through another wooden gate upon leaving the trees and continue on the grassy path which slowly descends down to another gate. Go through it and continue ahead on the left-hand side of a wall. Settle is now clearly visible down below. Continue ahead over another stile and eventually a wall comes in from the left to form a short walled grassy lane. Pass through a wooden gate and continue ahead. After a short time the familiar Malham sign is reached, that was the start of the first real climb of the walk. Continue past this sign, back through the gate and back into the walled track. Continue down through a wooden gate and back down to the road. Upon reaching the road, turn left down Constitution Hill and follow this back down into the market place. Turn right back onto the main road opposite the Royal Oak Hotel and the car park is a further two hundred yards on the left-hand side.